With over eight million members, Kaiser Permanente is the leading HMO (Health Maintenance Organization) in the United States. The Kaiser Permanente Insurance Company offers quality medical insurance coverage at affordable prices. Using Kaiser Permanente online services,get quotes, view plans and apply. With an added focus on preventative medicine, nutrition, and exercise, the goal of the Kaiser HMO is to get you well, keep you well, and cause your health to thrive. 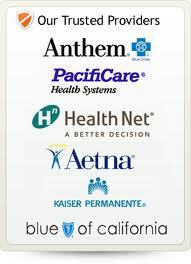 The $30 Copayment Plan is the most popular of the Kaiser Permanente California group health plans. Many business owners choose this middle of the road coverage in order to keep their premiums down while still offering quality coverage. Employers looking for the richest Kaiser medical insurance benefits often choose the $5 Copayment Plan which offers doctor visits for a low $5 copayment, emergency visits for $100, and no charge for hospitalization. Kaiser California Small Business Deductible Plans offer affordable monthly premiums and include some benefits before the deductible is met. Some commonly utilized benefits such as doctor visits and prescription drugs are covered immediately once you are enrolled. Primary and specialty care visits only require a $30 copayment which is not subject to the deductible. Area 1 - Alameda, San Fran, San Joachin, San Mateo, & Santa Cruz counties. Area 2&3 - Madera, Marin, Napa, Sacramento, Solano & Stanislaus, plus portions of Amador, Contra Costa, El Dorado, Fresno, Kings, Maripos, Placer, Sonoma, Sutter, Tulare, Yolo & Yuba counties. Area 4 - Portions of Imperial, Riverside & San Bernadino counties. Area 5 - Portionas of Los Angeles & San Diego counties. Area 6 - Orange county. Area 7 - Portions of Kern, Los Angeles, Tuilare & Ventura counties.